Peel shallots and cut in pieces. Remove threads from celery stalk and cut into pieces. Cut potatoes into cubes and fry in two tablespoons of oil. Add garlic, stir and allow to cool. Sprinkle guinea fowl pieces with salt and fry in two tablespoons of oil. Remove from pan and keep warm. Add two tablespoons of oil to the pan, turn up the heat and stir fry the shallots and celery. Add stock and beer and allow to cook for 4 to 5 minutes. Liquidise and sieve if necessary and allow to cool. Put mixed salad on plates with the slices of guinea fowl. Pour cooled sauce over and garnish with potato cubes and halves of mini tomatoes. 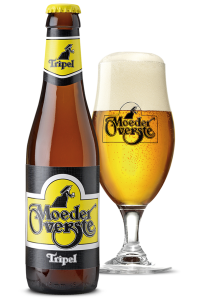 Serve with a nice cold glass of Moeder Overste beer.